These ships are going to be the surface equivalent of the Seawolf submarine, the baddest kid on the block but due to program cost overruns the class is reduced to numbers that make it more of a serviceable technology demonstrator than something with a fleet wide presence. Like the Seawolf, there will be three sisters and I'd expect it will eventually lead to a cheaper future replacement like the Virginia class that followed Seawolf. - The gun system. This thing can flat out throw some lead with 2 mounts for the new 155mm advanced gun system, the ship can toss precision guided rounds 70 miles at a rate equivalent to a battery of 12 howitzers. - VLS is spread out. 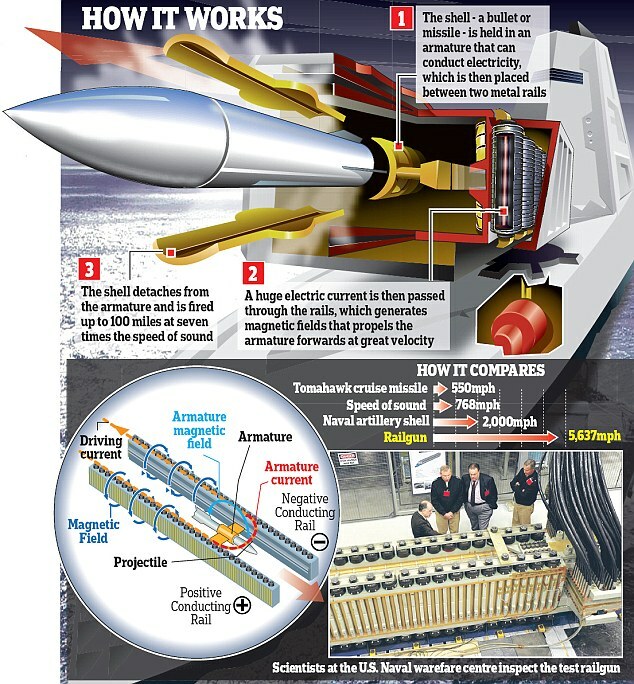 Instead of a group of vertical launch cells in front and back, they are scattered along the length of the exterior of the ship in pairs so a hit won't knock out the entire missile battery. - Electrical system is has 10 times the power of previous destroyers, leading to speculation it will be the platform ready to receive rail gun and laser type weapons when they become available. - This thing is freakin huge. 600 feet long and a displacement of almost over 14k tons (both more than a Tico) I have no idea why it isn't classified as a cruiser. I believe only a second one has been confirmed. The 3rd yet has to be finalized. This thing is freakin huge. 600 feet long and a displacement of almost over 14k tons (both more than a Tico) I have no idea why it isn't classified as a cruiser. As magnificant as this ship is going to be in a war it is just another floating target. Why do we spend all this money to build weapons for an enemy that does not exist? So folks in Mississippi and Maine can have decent paying jobs? I think creating jobs is a great6 idea by the way. Maybe they should be making things to repair our roads, bridges and water works? Or do you think America will pass more laws or the UN will take care of the problem? No doubt that thing is also packed with assorted computer and electronic technology. Which, unless it has massive redundancy or armor, must be extremely vulnerable to even very modest but strategic damage. Whereas old-school ships could sustain a tremendous amount of destruction and still remain formidable. I question the utility of it as well. Its strength is land attack with the big gun battery and mucho tomahawks, and the USN has certainly lacked serious naval artillery since we re-retired the New Jersey class battleships, but is that really a requirement of our modern navy? Our surface ships are mostly tasked with protecting carriers, which in turn can deliver far more precision guided ordinance greater distances with their air wing. Have you read up on the Navies rail gun?